So what does £26.99 get you these days? Well, in the Lego universe it buys you some damn fine kit. I actually bought this kit for my 10 year-old as something to do on a wet afternoon. Unfortunately it didn't last that long and we practically ripped open the box as soon as we returned home. 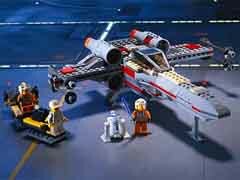 This is a fine kit and has so many excellent features that anyone who is a Star Wars fan or has children will enjoy spending a few hours putting this together. You also get four lego figures to play with too... what more could a guy want? Rush out now and buy this it is without a doubt the most fun I've had for ages! I spent a great afternoon being 10 again thanks to Lego. Oh yeah, and my son keeps asking me to let him have a go! Nah! I think I'll keep this one for myself.